Growing up we spent part of our summers on Cape Cod with my paternal Grandparents. We had the most wonderful Grammy who loved to bake and fill the house with love and comfort. So many of my childhood memories are centered around her and the fun we had with her. She would spend summer days braiding our hair, teaching us how to knit, making homemade play-dough, and showing me how to make goodies in the kitchen. There are so many things that make me lovingly think of her and our time on the Cape. One of the sweets that goes hand in hand with my memories of Grammy, are her hermits. They are made of sugar and spice and everything nice, just like she was. 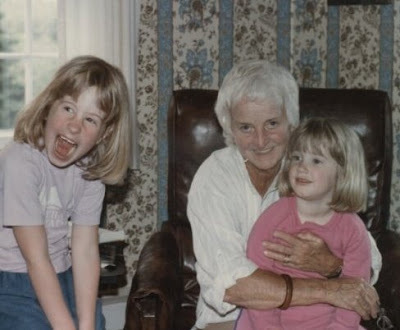 Me and my sister Lucy with our Grammy at the cottage. Everything about her was sweet, loving and so comforting. I had thought of making these a few times and shuffled through the recipes I had. I thought it was in there somewhere. It’s been years of me going back and forth, looking once again to see if it’s maybe in there and I didn’t see it the time before. I knew I could go online and print out a recipe for hermits, but that wouldn’t be the same. It didn’t seem right, it wasn’t hers. Luckily, I finally thought to ask my father if he had her recipes. He did! He sent me this and the recipe for her Blueberry Cake, which is another one of my summer favorites that I will be making soon. I’m really not sure where she ever got the recipe, it was typed on a recipe card with no notes of where it came from. In a large bowl, cream the shortening and the sugar, then add the molasses and the egg. Mix well and add vanilla. In a medium bowl, sift together the the dry ingredients except for the baking soda. Mix the baking soda with the lukewarm water. Stir until completely dissolved. Add the flour mixture alternately with the baking soda and water, beginning and ending with the flour. Then add raisins and nuts. Spread in a greased pan. Bake 8-10 minutes (could go up to 15 min.) but watch carefully as anything with molasses burns easily. About half way through cooking, when the batter is still tacky but not totally wet, sprinkle raw sugar on top. You could even make a simple frosting with confectioners sugar, but I prefer them without. Let them cool in the pan. Cut into squares with a serrated knife. We’ve recently launched the site RecipesUS.com where users can search through hundreds of thousands of recipes from American food sites and blogs. LOVE the picture of you with your sister and grandmother. I noticed you called her Grammy. We called my grandmother “Nana” and she also used to braid our hair and fix us the most wonderful food. She wasn’t a baker but the homemade tortillas and tamales and other dishes were made with a lot of care and love! I’ll think I’ll try making your hermits with some walnuts in them. They look yummy! Thanks, Lisa! She really was the sweetest and I’m lucky to have the fondest memories of her. Aren’t grandparents wonderful!? Oh please let me know if you like them!